The Franks had felt kinship with the Muslim soldiers at the battle of Dorylaeum in 1097, but two years later when the Crusaders conquered Jerusalem they seemed unable to see the Muslims as human beings like themselves. They slaughtered the inhabitants of the city in cold blood in a massacre which shocked even their own contemporaries. After this, Muslims were regarded as vermin to be cleared away from the holy places: the official word for them in Crusading jargon is 'filth'. Mahound's fictional status in the West has perhaps made it even more difficult for people to see him as an historical character who deserves the same serious treatment as Napoleon or Alexander the Great. The fictional portrait of Mahound in The Satanic Verses resonates deeply with these established Western fantasies. 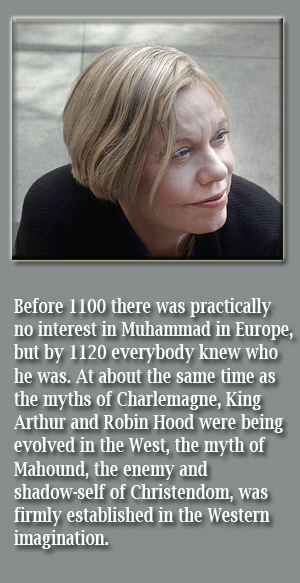 To explain Muhammad's success, the legends claimed that he had been a magician who had concocted false 'miracles' to take in the credulous Arabs and destroy the Church in Africa and the Middle East. One tale spoke of a white bull which had terrorised the population and which finally appeared with the Qur’an, the scripture which Muhammad had brought to the Arabs, floating miraculously between its horns. Muhammad was also said to have trained a dove to peck peas from his ears so that it looked as though the Holy Spirit were whispering into them. His mystical experiences were explained away by the claim that he was an epileptic, which at that time was tantamount to saying that he was possessed by demons. His sexual life was dwelt on in prurient detail: he was credited with every perversion known to men and was said to have attracted people into his religion by encouraging them to indulge their basest instincts. There was nothing genuine in Muhammad's claims: he had been a cold-blooded impostor who had taken in nearly all his own people. Those of his followers who had seen through his preposterous ideas had kept quiet because of their own base ambition. The one way that Western Christians could explain Muhammad's compelling and successful religious vision was to deny its independent inspiration: Islam was a breakaway form of Christianity, the heresy of all heresies. It was said that one Sergius, an heretical monk, had been rightly forced to flee Christendom and had met Muhammad in Arabia, where he had coached him in his distorted version of Christianity. Without the sword, 'Muhammadanism' would never have flourished: Muslims were still forbidden to discuss religion freely in the Islamic empire. But Muhammad had come to a fitting end: during one of his demonic convulsions he had been torn apart by a herd of pigs. Some details of this fantasy reflect Christian anxieties about their own emergent identity. Islam was stigmatised as the 'religion of the sword' during the Crusades, a period when Christians themselves must have had a buried worry about this aggressive form of their faith which bore no relation to the pacifist message of Jesus. At a time when the Church was imposing celibacy on a reluctant clergy, the astonishing accounts of Muhammad's sexual life reveal far more about the repressions of Christians than about the facts of the Prophet's own life. There is a definite note of ill-concealed envy in this depiction of 'Islam' as a self-indulgent and easygoing religion. Finally it was the West, not 'Islam', which forbade the open discussion of religious matters. At the time of the Crusades, Europe seemed obsessed by a craving for intellectual conformity and punished its deviants with a zeal that has been unique in the history of religion. The witch-hunts of the inquisitors and the persecution of Protestants by Catholics and vice versa were inspired by abstruse theological opinions which in both Judaism and Islam were seen as private and optional matters. Neither Judaism nor Islam share the Christian conception of heresy, which raises human ideas about the divine to an unacceptably high level and almost makes them a form of idolatry. The period of the Crusades, when the fictional Mahound was established, was also a time of great strain and denial in Europe. This is graphically expressed in the phobia about Islam. It was becoming apparent that Western Christians were not going to be able to accommodate different religious communities and ideologies within their own systems as successfully as either the Muslims or the Byzantines. The only other alien religion on European soil was Judaism, and the First Crusaders had begun their journey to the Middle East by massacring the Jewish communities along the Rhine valley in the first mass pogroms of Europe. Anti-Semitism would become an incurable European disease during the Crusading period and, at the same time as Christians evolved the myths about Mahound and the Saracens, they also evolved terrifying fantasies about the Jews. Jews were said to murder little children and mix their blood in the Passover bread, to desecrate the Eucharist and to be engaged in a vast international conspiracy for the overthrow of Christendom. There was nothing like these anti-Jewish myths in the Islamic world; they reveal in the Western psyche an unhealthy disturbance and disease. But the conquests in Spain, southern Italy and Sicily meant that there were now tens of thousands of Muslims within the borders of Christendom. The only way that the establishment seemed able to cope with these aliens was by imposing an official policy of apartheid, forbidding Christians to have any contact with their Muslim and Jewish neighbours. Special Church legislation linked the two together as a common foe in the Lateran Councils of 1179 and 1215. Christians were forbidden on pain of excommunication and the consequent confiscation of their property to take service in the houses of Muslims and Jews, to look after their children, to trade with Muslims and Jews or even to eat with them. In 1227 Pope Gregory IX added the following decrees: Muslims and Jews must wear distinctive clothing; they must not appear on the streets during Christian festivals or hold public office in Christian countries; and the muezzin was forbidden to offend Christian ears by summoning the Muslims to prayer in the traditional way. Please type '761' into this field.